Eursalea F. Gaul, 87, of Atchison, KS, passed away Saturday, January 12, 2019 at the Medicalodge of Atchison. Funeral service will be 2:00 PM, Thursday, January 17, 2019 at Trinity Lutheran Church, with Rev. Robert Ziegler officiating. Burial will follow at Highland Cemetery, Highland, KS. Family will receive friends prior to the service from 1:00 PM to 2:00 PM at the church. Memorials are suggested to Trinity Lutheran School Technology Endowment Fund and may be sent in care of the Becker-Dyer-Stanton Funeral Home who is handling the arrangements. Online condolences may be left at www.beckerdyer.com. Eursalea was born February 7, 1931 in Highland, KS, the daughter of Joseph Elmer and Leila Pearl (Shields) Rawles. She was a housewife and also babysat in her own home for many years. 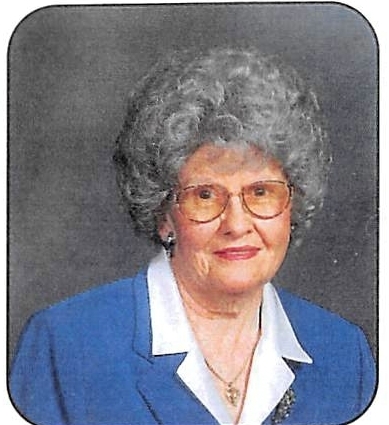 Eursalea was a member of Trinity Lutheran Church, Morning Break at the church, helped with funeral dinners and visited shut-ins from the church. She also volunteered for the Atchison Hospital Auxiliary. Eursalea enjoyed yard work, gardening and flowers. Eursalea married Edgar Gaul on December 3, 1950 at Christ Lutheran Church; he preceded her in death on November 1, 2000. Survivors include a son Dwight and Patty Gaul, Atchison, KS, a daughter Katherine and John Kriepe, St. Joseph, MO, three grandchildren, Michael (Jennifer) Gaul, Christopher (Tracy) Gaul, Joanna (Daniel) Teubner and five great grandchildren, Ethan, Holden, Madalinn, Marlee, Baxter Gaul, and a sister Alice Sutherland. She was also preceded in death by her parents, four brothers, Gerald, Donald, Clarence, Joseph Elmer, Jr. Rawles, two sisters, Leila Bishop and Yolanda VanHemelryck.